The world-famous Phaistos Disk is one of the great treasures in the Archaeological Museum of Herakleion in Crete, Greece. It is also one of the most famous unsolved mysteries in the field of archaeology. Countless attempts have been made to decipher the 15cm disk and its 45 different symbols, including scholarly discussions of its relationship to other ancient scripts such as Greek, Anatolian, Semitic, and even Indian, Chinese, and Polynesian. Attributions have linked it to deities in Greek mythology, the Hittites and Philistines, and Osiris and Isis in Egypt. The Phaistos Disc is a disk of fired clay from the Minoan palace of Phaistos, possibly dating between 1950 BC and 1400 BC, the middle or late Minoan Bronze Age (2nd millennium BC). It is about 15 cm in diameter and covered on both sides with a spiral of stamped symbols. Its purpose and meaning, and even its original geographical place of manufacture remain disputed. It has been interpreted as an adventure narrative, a poetic verse, a magical curse, a board game, and even musical notes for a stringed instrument. Pseudoarchaeologists have claimed that it is a message from extraterrestrials and even a portal or 'stargate' with which a wormhole can be created to enable one to achieve teleportation to cosmic distances. There are still strong questions regarding its authenticity. Some speculate that the disc is a clever forgery created specifically to boost the reputation of its discoverer. To date, the Herakleion Archaeological Museum (current location) in Greece will not allow the dating of the disc. Until that time, its authenticity will remain a mystery. The Phaistos Disk, today on display at the Iraklion Archaeological Museum, was discovered in Crete in 1908. The Phaistos Disc was discovered in the basement of room XL-101 of the Minoan palace-site of Phaistos, near Hagia Triada, on the south coast of Crete. Italian archaeologist Luigi Pernier recovered this remarkably intact 'disk', about 15 cm in diameter and uniformly just over 1 cm thick, on July 3, 1908. Luigi Pernier discovered the disc during his excavation of the first Minoan palace. It was found in the main cell of an underground 'temple depository'. These basement cells, only accessible from above, were neatly covered with a layer of fine plaster. Their context was poor in precious artifacts but rich in black earth and ashes, mixed with burnt bovine bones. In the northern part of the main cell, a few inches southeast of the disk, and about twenty inches above the floor, Linear A tablet PH-1 was also found. The site apparently collapsed as a result of an earthquake, possibly linked with the explosive eruption of the Santorini volcano that affected large parts of the Mediterranean region ca. 1628 BC. Phaistos - also Phaestos and Phaestus - was an ancient city on the island of Crete. Map of Minoan Crete Phaistos was located in the south-central portion of the island, about 3 1/2 miles from the sea. It was inhabited from about 4000 BC. A palace, dating from the Middle Bronze Age, was destroyed by an earthquake during the Late Bronze Age. 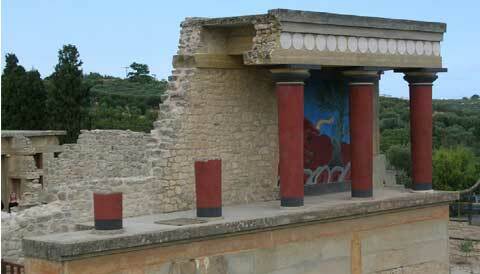 Knossos as well as many Minoan sites were destroyed at that time. The palace was later rebuilt toward the end of the Late Bronze Age. The inscriptions were made by pressing pre-formed hieroglyphic 'seals' into the soft clay, in a clockwise sequence spiraling towards the disc's center. It was then baked at high temperature creating this terra-cotta artifact. 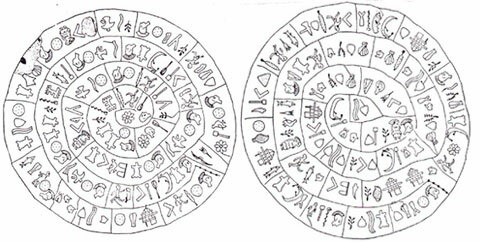 Each side of the disc is decorated with 45 different symbols appearing a total of 242 times. Many of the 45 different glyphs represent recognizable objects, including human figures, fish, birds, insects, plants, a boat, a shield, a staff, weapons, etc. In addition to these, there is a small diagonal line that occurs underneath the final sign in a group a total of 18 times. The disk shows traces of corrections made by the scribe in several places. Although there is no official Unicode encoding for the symbols on the disk, the ConScript Unicode Registry has assigned a block of the Unicode Private Use Area to be used for the script. Two fonts include support for this area; Code2000 and Everson Mono Phaistos. The text on the disk is given on the second of these links; you can read that text if you have either of them installed. There are a number of glyphs marked with an oblique stroke, the strokes are not imprinted but carved by hand and are attached to the first or last sign of a 'word', depending on the direction of reading chosen. Their meaning is a matter of discussion. One hypothesis, supported by Evans, Duhoux, Ohlenroth and others, is that they were used to subdivide the text into paragraphs, but alternative meanings have been offered by other scholars. From the diverse epigraphical facts (overcuts, angulous points of the spirals, corrections, etc. ), it can be shown that the text has been written from the exterior to the center. Some of the symbols are stamped very close to their neighbors and actually overlap. The ones closer to the centre were printed on top of the outer ones, again indicating that the message reads from outside to center. There are also lines drawn on the disc marking out the path of the symbols, and dividing them up into groups and each of these groups should represent a word. If we assume that the symbols of men, heads etc are intended to be correctly oriented, then the message reads from right to left, with the figures facing towards the beginning of the message, as is normal in Egyptian hieroglyphs. The fact that most of the corrections were done on the spot, and other epigraphical facts, are showing that the scribe was 'composing' his text in proportion as he was printing it. There is therefore no way to dissociate the direction of printing from the direction of reading. A great deal of speculation developed around the disc during the 20th century. Many attempts have been made to decipher the code behind the disc's glyphs. Historically, almost anything has been proposed, including prayers, a narrative or an adventure story, a 'psalterion', a call to arms, a board game, a geometric theorem or even a calendar. While many still believe the mystery can be solved, scholarly attempts at decipherment are thought to be unlikely to succeed unless more examples of the glyphs turn up somewhere. The uniqueness of this archaeological object is contested by at least two other apparently related specimens - a votive double axe found by Spyridon Marinatos in the Arkalohori Cave, Crete, and a fragment of a smaller clay disk, found at Vladikavkaz, North Ossetia. But both inscriptions were engraved, not made with stamps. Moreover, the first contains only superficially similar hieroglyphics, and the second, interesting as it might prove, disappeared mysteriously. So until more examples of this strange script are discovered, the Phaistos disc will remain an enigma.